Here is the next installment to the Organic series. I hope you like it as much as I do. 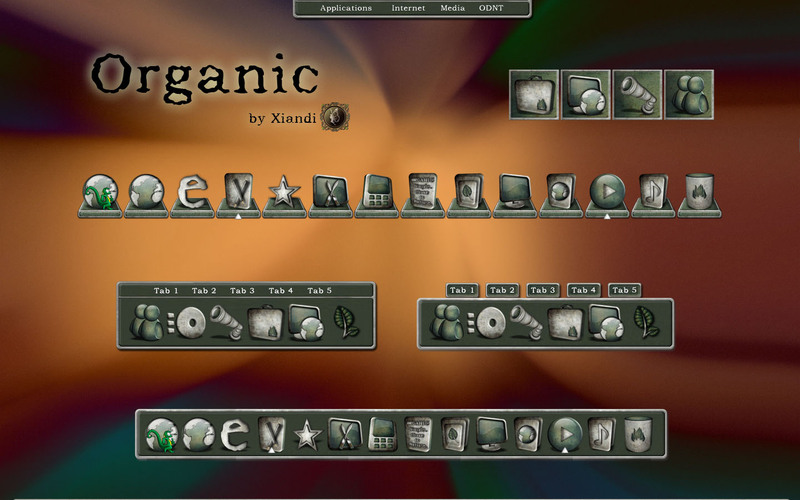 Thanks once again to Skinhit for creating the excellent Organic IP that this is based on! The zip file contains 2 Tab styles, 2 Tile styles and zoomers...and permission. Update 3/22/2010: Better graphics and a cleaner look! Thanks WebGizmos! I'll do that! Great work, Xiandi...you are amazing in your versatility and artistry. Lady if you do a WB and cursor....Watch out! Hi David! Thank you! When you download them, you should unzip them in to this folder...C:\Program Files\Stardock\ObjectDock\Backgrounds. Then they should show up for you when you go to change the backgrounds. I think the improvements that you've made in all the new versions are significantly better than the originals. Thanks.